Four Double Crochet Popcorn (Pop): 4 dc in same space. Remove the hook from the loop, insert hook into top of 1st dc from the front of the st, catch the loop you just dropped, and pull it through the top of 1st dc. 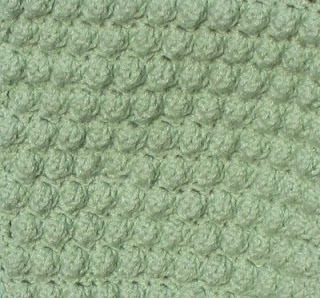 Notes: Popcorns are another great textured stitch which are much easier than they look. 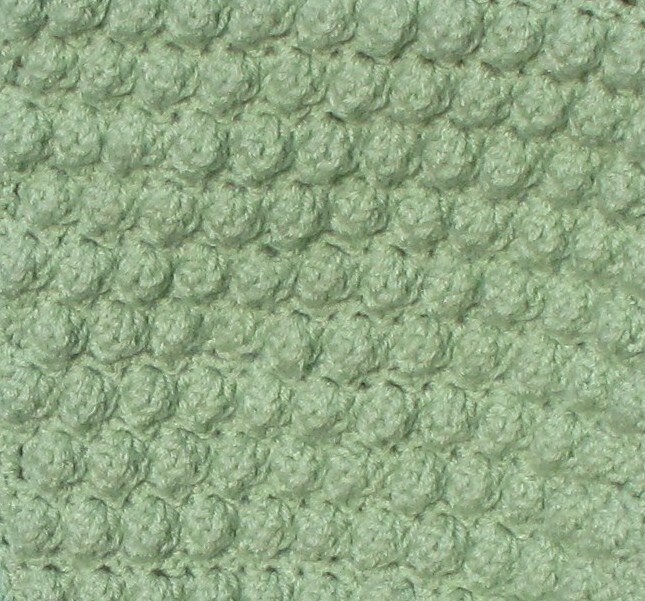 All the lumps and bumps make the finished stitches look a little like popped popcorn. Like with the bobbles, it helps to poke the tip of your finger into the stitch as you pull it tight. Be careful, popcorns in particular can accidentally be “popped” through to the other side of the fabric messing up your texture. I cannot believe we are already on the last square! I hope everyone has been having fun trying new stitches. I am trying to get back to finishing up the 4 different versions I have started so I will have them done in time to display at our local Quilt & Fiber Arts Festival, as well as the County Fair, both coming up the first week in August. We will be sewing together donated squares during the Fiber Festival August 5th and 6th and donating them on Rowan's Birthday the following week. If you have squares or blankets or even hats to send in, please mail them soon to the address I posted in my very first post. Hello Barbina! You mean people are actually finishing the entire pattern? How cool! I am glad you enjoyed following along. I would love to see pics of your finished afghan. I will keep an eye on your Ravelry project. I am so glad you found us! Thank you so very much for the Popcorn Stich and the Square Pattern.